When I was a little girl, probably 7 or 8 years old, I remember my mother telling me that pancakes were for dinner one night. I thought she had lost her mind. I can clearly recall thinking: you can’t have breakfast for dinner – it’s just not right. Now at 26, breakfast for dinner is one of my favorite things to do. Usually I will do this when it will be just me for dinner. It’s really quick, affordable, and perfect for one person because I almost always have everything I need on hand. As I sat at work, waiting for my computer to find the file I needed, I started brainstorming about what to do for dinner. By the time I finally had the file – dinner plans were set. Breakfast sandwich! Personally, I am a huge fan of the breakfast sandwich. I won’t lie; I love them because bacon and cheese are a fairly standard choice. While I have always loved bacon (sadly I could eat a pound of it by myself), I haven’t always been a huge fan of eggs. As a kid I would dip my sausage, bacon, or toast in the yolk of a sunny side up or over easy egg, but I wouldn’t touch scrambled or eat the whites. It wasn’t until I was 18 or 19 and managing a restaurant inside of a charming hotel that had a Sunday brunch that I actually started to even consider trying them. We had an omelet station on the brunch and the omelets just looked so GOOD! And after a long Saturday night, they were calling to me. I would load them up with every veggie possible, some bacon, and a ton of cheese. Not to mention a good amount of salt and pepper. Nowadays, I will eat eggs in a variety of ways but never plain or by themselves. I guess you could say they have to be “masked” in some way shape or form. Back to dinner! Tonight I made a breakfast sandwich for dinner. It was super simple and ready to eat in about 15 minutes. 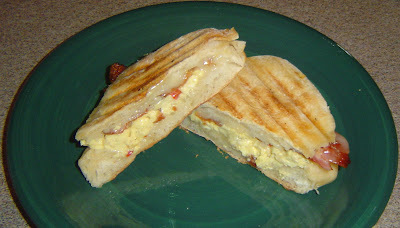 This delightful dinner had crispy bacon, eggs with red bell pepper and onion, and creamy havarti cheese on a ciabatta roll. Say it with me now: Mmmmmmm! 1- Start your bacon or sausage or even ham. 2- Dice up onion and red bell pepper. Sauté till soft in a small sauté pan. 3- Whisk together your eggs with a little splash of milk and S&P. I used two eggs. 4- Once the veggies are soft, add a little more butter and then add your eggs. 5- Here you can either scramble your eggs or make them omelet-like. I was going for omelet-like but I got distracted and had to switch to scrambled. Tastes the same but omelets are easier to work with in a sandwich. 6- Slice ciabatta and layer each side with sliced cheese. Place the eggs on the bottom half, the bacon of the top half, and then put the two halves together and mush down. 7- Here you have several choices: 1-eat as is, 2- toast up in the oven or 3- press it. 8- I pressed mine using my decade old George Forman that is still kicking. It took about 3-5 minutes for the cheese to melt and the bread to get a nice crunch to it. Before adding it to the grill, I find that lightly brushing the bread with a little EVOO helps keeps it from getting burnt. Interesting Food Fact: Ciabatta literally means “carpet slipper”. Who knew? Well… the Italians I guess. My thoughts on this dish: Quick and simple – which I love. Havarti was a great choice for cheese because it melts really well and got nice and gooey. I love ciabatta and it had a nice crunch on the outside, but still chewy and soft on the inside. I would have loved if my eggs where omelet style, but scrambled with the peppers and onions was good too. And with all the cheese on there I didn't have to worry about the egg falling out of my sandwich. This is always a good thing in my book.